Whatever Happened to Gerald Bostock? Released in 2012, Thick as a Brick 2, abbreviated TAAB 2 and subtitled Whatever Happened to Gerald Bostock? 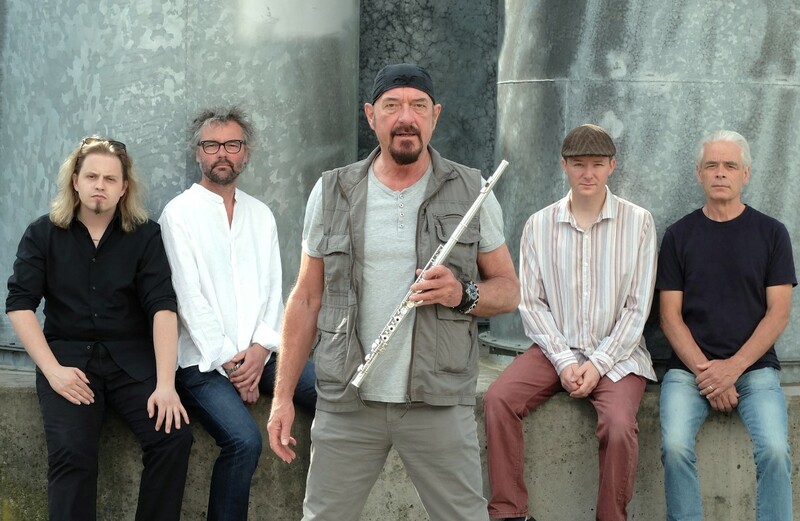 is the fifth studio album by Ian Anderson, and is a follow-up of Thick as a Brick, Jethro Tull’s highly acclaimed 1972 album. The album debuted at No. 55 on the Billboard chart, at No. 13 in the German Albums Chart, at No. 12 in the Finnish Album Chart, at No. 19 in the Austrian Album Charts, at No. 30 in the Norwegian Album Charts, at No. 31 in the Swiss Album Charts, at number No. 74 on the Canadian Albums Chart, at No. 35 on the UK charts, at No. 76 in the Dutch Album Chart and at No. 99 on the Spanish charts. Thick As A Brick 2 focuses on Gerald Bostock, the fictional boy genius author of the original album, forty years later. The follow-up album presents five divergent, hypothetical life stories for Gerald Bostock, including a greedy investment banker, a homosexual homeless man, a soldier in the Afghan War, a sanctimonious evangelist preacher, and a most ordinary man who (married and childless) runs a corner store; by the end of the album, however, all five possibilities seem to converge in a similar concluding moment of gloomy or pitiful solitude. 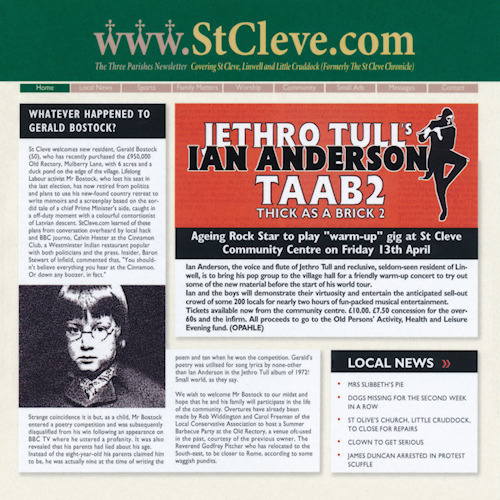 In March 2012, to follow the style of the mock-newspaper cover (The St Cleve Chronicle and Linwell Advertiser) of the original Thick as a Brick album, an online newspaper was set up, simply titled St Cleve.